When I check my email every day, the majority of my messages are filled with questions about compatibility between different Myers-Briggs® types. People want the theory of personality type to tell them which types they will or won’t mesh with, and that’s understandable. In fact, there are lots of charts out there that say which types are supposedly most compatible. But I’m going to let you in on a little secret. Those charts do more harm than good. What bothers me most is that people are using those charts as a reason to stay away from potential partners or a way to see problems in their relationship they wouldn’t have noticed otherwise. In fact, certain people have gone so far as to leave their partners because they saw that they weren’t compatible in a chart someone probably threw together in 10 or 15 minutes off of flawed personality research. Any type can get along with any other type. But it’s essential that you appreciate not only the commonalities you share, but the things that make you different. It’s all too easy to see your partner’s differences and see them as weaknesses or traits that need “fixing”. And this never bodes well for any relationship. This is especially true in intuitive/sensor relationships. These two sets of people can get along incredibly well, but not if they’re always seeing the other’s viewpoint as “flawed” or “inferior”. Intuitives can fall into the trap of thinking that sensors are “boring”, “not deep enough” or “unimaginative”. Sensors can fall into the trap of thinking that intuitives are too “out of touch with reality”, “convoluted”, or again “boring”. I think we all need to collectively realize there is no one right way to live or perceive. Intuitives have strengths just as sensors do, and one is not superior to the other. As an INFJ married to an ESTP I’ve had nearly eight years of relationship experience in this area, and I’ve also spoken with a lot of other couples in sensing/intuitive relationships. And guess what? These relationships can thrive in amazing and beautiful ways. Intuition is a perceiving function. People with an intuition preference trust what lies ‘behind the scenes’. They look for hidden meanings, patterns, symbols, and theoretical possibilities. They tend to be very focused on the future, sometimes at the expense of the present moment. Extraverted Intuitives (ENFPs, ENTPs, INFPs, INTPs) are stimulated by all the potential they see in the outer world. The world around them is a springboard for numerous ideas and future possibilities. They enjoy brainstorming and jumping from idea to idea to imagine how things could play out. They are extremely innovative and imaginative and their ideas often have a theoretical tone. They like to explore numerous angles and tend to keep a very open-mind. Introverted Intuitives (INFJs, INTJs, ENFJs, ENTJs) form long-term conclusions and strategies for how things will most likely play out. They think visually, using many abstract symbols to make sense of their perceptions. Their future insights are often uncannily accurate. Their ideas often come to them “out of the blue” and are usually internalized, unlike Ne which is stimulated by the outer world and is more externalized. Introverted Intuition has less breadth then Extraverted Intuition, but more depth. Intuitives also use sensing, but this is less comfortable for them to use. Just as a right-handed person can also use their left hand, so an intuitive can also use sensing, just less comfortably and with less mastery. Sensing is a perceiving function. People with a sensing preference trust what they see in the concrete world. They are detail-oriented and realistic people who are often called “down-to-earth” and grounded. They trust facts and personal experience, and are very observant of what is happening around them. They are less focused on theoretical possibilities and more focused on the needs of the day or practical planning for the future. Extraverted Sensors (ESFPs, ESTPs, ISFPs, ISTPs) live “in the moment” and are usually adaptable and easy-going. They are extremely realistic and tend to think quickly in a crisis to solve problems. They are incredibly observant of the world around them and know how to adapt to changes in their environment quickly. They learn best through hands-on experience and usually love to work with their hands and be physically active. They are curious and enjoy absorbing a great number of facts. Introverted Sensors (ISTJs, ISFJs, ESTJs, ESFJs) are extremely practical, responsible, and matter-of-fact. They are very detail-oriented and they trust what they know through personal experience. They remember facts with incredible accuracy, and can easily spot inaccuracies and changes. They like consistency and routine and they are good at maintaining stability and keeping important traditions alive. Sensors also use intuition. However, this is less comfortable for them. Just as a right-handed person can also use their left hand, so a sensor can also use intuition, just less comfortably and with less mastery. Opposites attract for a reason. We all tend to seek out someone who will “complete” us and give us a sense of balance in our lives. Because of this, thinking types will often find themselves drawn to feeling partners, and intuitives drawn to sensors, etc,. Intuitives, who are often caught up in their imagination and focused on theoretical ideas can find themselves drawn to the grounded, practical nature of the sensor. In the intuitive/sensing relationship, one partner can focus on the big picture and the theoretical possibilities while the other can focus on the details, the moment, and ensure that decisions are practical and realistic. Both can be drawn to the skills and insight that the other partner brings to the table. For example, as an INFJ I can get caught up in existential concerns and I can be so focused on trying to predict what the future holds that I lose sight of what is needed right now. My ESTP husband is great at reminding me of what is important in the moment, and he also helps me to relax and take things one day at a time. When a crisis hits, he keeps calm and quickly responds with smart, practical solutions. Many intuitives I’ve spoken with have similar experiences with their sensing partners. In the same way, the intuitive can help the sensing partner to see the big picture and how things will likely play out. The intuitive can offer up angles and possibilities that give the sensor a broader understanding of the world. Both partners bring a skill set to the table that the other one is lacking, and this can create an extremely balanced, fulfilling relationship. Intuitives are drawn to the easy-going, adventurous nature of the Sensing/Perceiving type. SPs are quick-witted individuals who are intensely aware of the present moment and how to make the most of it. They are fun-loving people, who see experiences and adventure everywhere. They can help the intuitive to be more mindful of “now” and to take things one day at a time. SPs tend to have a natural physical grace and awareness of their environment that is attractive to intuitive types who are more often “lost in their heads”. The SP can pull them into the world and help them to see all the things they can enjoy and experience in the sensory, tangible realm. STPs are highly logical and great at problem-solving and handling tasks efficiently. SFPs have very deep feelings and values and can bring empathy and emotional depth to the table. Both STPs and SFPs have a kinesthetic intelligence and wit that is lively and intriguing to the intuitive. An important note: NJs share Introverted Intuition (Ni) and Extraverted Sensing (Se) with SP types. In mid-life SP’s can enjoy many Ni-centered ideas and topics, and NJ types can enjoy utilizing Se more. This is especially true for SP’s with Ni in the tertiary position and NJs with Se in the tertiary position (ISTPs, ISFPs and ENTJs, ENFJs). The biggest problems that sensors and intuitives face in relationships are related to their different interests, and their different methods of communication. Intuitives love discussing what “may be” or what they predict will happen in the future. They love theoretical and abstract possibilities and ideas. They are stimulated by metaphorical speech and symbolic details, and when they tell a story they tend to jump around from one part to another, focusing on the big picture and skipping over details or facts they see as unnecessary. Intuitives love the existential, the unknown, the “yet to be discovered”. SPs are action-oriented individuals who enjoy “doing” more than talking, but when they do talk they enjoy discussing their experiences, interesting stories from their day, or their plans for the moment. They like to discuss tangible information, data points, and specific observations. They like language that is precise and they speak in a sequential order. Sensors start with the facts and lead up to the big picture. Now don’t get me wrong, SPs don’t love “small talk”. They can enjoy discussing plans, possibilities, and opportunities, but they enjoy discussing things that have a tangible, fact-based reality. Discussing abstract, hypothetical scenarios holds very little interest for them. SPs are people of action. They like to experience the world in a physical way, and they like to interact directly with it. They are less concerned with discussing and speculating about what “could” happen, which is one of the most exciting things for the intuitive. SPs also tend to like movies and books that have a stronger action component. Intuitives can get lost in theoretical books and non-linear storylines. They can enjoy art-house movies and abstract cinema. SPs like linear storylines, books that are grounded in concrete facts, and movies/stories that are entertaining and relatable to everyday life. They can greatly enjoy fantasy movies, but those movies will often have strong sensory components and will move in a linear fashion. This isn’t a big issue, but it can cause rifts between couples who can’t come to an agreement on what they want to watch/read/participate in. Disclaimer: What I’ve said about interests is not “absolute”. For every 8 SPs who like linear storylines, there will be a couple that love the non-linear and the abstract film. This is especially true for SP’s in mid-life who are becoming more in touch with their tertiary and inferior functions. NJs and SPs have very different lifestyle preferences. NJs like to have a plan for the future, and they like to have closure on their decisions. They feel tense or stressed when decisions are left open-ended for too long. In turn, SPs can feel stressed if the NJ pushes them to come to decisions too quickly or makes them plan too far ahead. It’s important for these pairs to “meet in the middle” and find ways to appreciate and give freedom to their partner’s preferred lifestyle. Remember that there is no “right” way to be. Judging types can often meet deadlines sooner, but perceiving types can also find creative improvements as they wait to complete something. NPs and SPs can struggle because they use different types of intuition. NPs use Ne, and SPs use tertiary or inferior Ni. SPs can easily tire of theoretical “brainstorming” or exploring numerous rabbit trails of abstract thought. NPs, in contrast, can feel unfulfilled if their partner doesn’t engage or seem interested in the possibilities they are bringing to the table. They may feel that they have to constrain their numerous thoughts because their partner simply isn’t interested. Intuitives have a difficult time taking things at face value. Our minds are designed to find connections and meanings behind things. As a result, the sensor may make a simple statement, and the intuitive will often extrapolate information from that one comment. This can lead to misunderstandings and frustration for the sensor who just wants to be able to speak his/her mind without having to explain scenarios that never crossed their minds and have no relevance to the matter at hand. Intuitives, in turn, can feel that sensors are missing the deeper meaning or context of what they are trying to say when they speak. Intuitives and sensors can both start feeling that their partner’s mode of perceiving is inferior to their own. The intuitive can feel that the SP is too focused on the day-to-day and is not “intellectual” enough, whereas the SP can feel that the intuitive is impractical and focused on unproductive thoughts and projections that are useless because “nobody can know what will happen”. Both types can turn up their nose at their partner’s perceptions, their lifestyle, and the information they trust. – Go out of your way to appreciate each other’s strengths. Complement each other on your differences. The intuitive can praise the sensor for their awareness, their attention to detail, their physical abilities, their problem-solving capabilities, their thinking or feeling strengths, their down-to-earth, practical nature, and their opportunistic intelligence. Remember, this is all part of what drew you to them initially. For the sensor, this can mean praising the intuitive for their insight, imagination, out-of-the-box thinking, and ingenious ideas. You can praise them for their thinking/feeling strengths, their visionary focus, and their plans for the future. Remember, this is part of what drew you to them at the beginning. – Find interests and activities you both enjoy. There are many activities that both sensors and intuitives can enjoy. I guarantee you can find movies and books you both like, games and projects you both love. Brainstorm about shared interests and activities and keep them mentally available for times when you want to spend quality time together. My ESTP husband and I both love strategy games, we both enjoy fantasy movies, we both love reading mysteries and classic literature, we both love traveling and going on road trips. Open your mind to new possibilities and activities that you both might enjoy if you just give them a try! – Do not start thinking your preference makes you better or “superior”. Remember that neither of you is innately “better” than the other because of your sensing/intuitive difference. Stop yourself if you start thinking condescending thoughts about your partner. It’s not productive, it’s not fair, and it will only cause conflict and dissatisfaction. – Watch out for each other’s “triggers”. If your dominant function is the inferior function of your partner, forcing them to access it extensively can be very stressful for them. For example, if you’re a Ni-dominant INFJ or INTJ, and you’re partnered with an ESP type, you don’t want to make them deal with future projections and abstract theories for hours every day. Likewise, if you’re an ESP you don’t want to inundate the INJ with sensory overload every day. – Find friendships with other intuitives or sensors depending on your type. Absolutely make quality time for your partner and enjoy every minute of it. But don’t feel bad about scheduling time with an intuitive/sensing friend who just loves talking about the same things as you do. – Be patient. In mid-life each person starts to develop their tertiary and inferior functions more. Many sensing/intuitive relationships improve in mid-life once both partner’s start developing their opposing preference more fully. SPs will enjoy using Ni more as they reach mid-life and intuitives will enjoy using sensing more as they reach mid-life. – Enjoy the amazing qualities your partner has. Really think about what drew you to them when you first met. Remember how intrigued you were by the ways they were different from you. – Learn about your partner’s personality type in-depth. This way, when there’s a disagreement or conflict you can empathize with where they are coming from and avoid arguments or fights. – Find ways to combine each other’s interests. As an example, my SP husband enjoys discussing my ideas and theories while we’re out doing a project together. We can be taking a walk, a jog, or playing a video game while we talk about our various interests and thoughts. This way we’re actively engaged in something which stimulates his sensing side, and we can both take turns listening to each other’s ideas. As an ESTP this is much better for him than just sitting and theorizing for hours on end. – Love each other. I know this seems obvious, but it’s important. When you love someone you take an interest in their ideas, their life, their plans, their interests. It doesn’t matter if their stories don’t apply to your sensing/intuitive perceptions, you care about them, so you make their life important to you. Your interests and conversation topics may vary, but staying “tuned in” to your partner’s thoughts and ideas is always extremely important. Intuitives are drawn to the practical, responsible nature of the SJ type. SJs are down-to-earth, devoted individuals who are known for their stability and reliability. They can be a calming, steady force in the intuitive’s life and together they can make an unstoppable team. SJs are very observant individuals who can help intuitives to remember important facts and details as they work on projects and goals. They can help the intuitive to see practical, step-by-step ways of bringing projects to completion. Intuitives have a very good grasp of the big picture and can find unique strategies for achieving a goal. They can help the sensor to see innovative ways to accomplish their goals, and they can help them not to get “lost” in the details. Intuitives can give unique insights and imaginative possibilities to the SJ that will improve their life, their plan, and add richness to their everyday experience. The intuitive can help the SJ to see more clearly into future possibilities and prepare accordingly. – NP types share Extraverted Intuition (Ne) and Introverted Sensing (Si) in common with SJ types. In mid-life SJ’s start to develop their tertiary or inferior Ne, and can enjoy many more of the NP’s thoughts and ideas. Likewise, in mid-life the NP can enjoy more of the SJ’s sensing thoughts and perspectives. Many of the struggles between SJ’s and intuitives will be the same and/or similar to the struggles with SPs and intuitives. You may see a little repetition here. Intuitives love discussing what “could be” or what they foresee happening in the future. They love theoretical and abstract possibilities and ideas. They are stimulated by metaphorical speech and symbolic details, and when they tell a story they tend to jump around from one part to another, focusing on the big picture and skipping over details or facts they see as unnecessary. Intuitives love the existential, the unknown, the mysterious. SJs like clear, sequential, literal conversation. They like their topics to go from point A to point B, and they don’t like jumping around all over the place. They also tend to distrust abstract reasoning or intuitive “hunches”, so this can create some skepticism and conflict in conversations. SJs dislike missing details, and feel that when people skip over details to explain something that they are untrustworthy. When SJ’s do talk, they enjoy discussing their experiences, interesting stories from their day, or their plans for the moment. They like to discuss tangible information, data points, and specific observations. They like language that is precise and they speak in a sequential order. Sensors start with the facts and lead up to the big picture. As a result of the different communication styles, SJ’s and intuitives can become “bored” or restless when their partner is talking. They may need to use extra concentration to pay attention and follow what their partner is trying to say. SJs place a great amount of trust in their personal experience and facts they’ve accumulated from trusted authorities. They trust the “tried-and-true” technique and verifiable sources. Intuitives, in contrasts, tend to trust new theoretical hunches and strategic insights. They don’t put much stock in authority and would rather try a new technique than one that has already been mastered. When psychologist David Keirsey studied personality type and intelligence, intuitives were gifted with “strategic” intelligence, and SJs were giftd with “logistical” intelligence. Intuitives were not adept at logistics, and SJ’s were not adept at strategy. Because what these two types trust is so different and because their gifts are so different, SJs and Intuitives can get into heated arguments about the “right” way to do things. SJ’s are quite sure their personal experience or the facts they trust are the ultimate authority, and Intuitives are quite sure their new strategy, innovative thought, or gut feeling is leading them in the right direction. SJs are lovers of history, tradition, and sensory enjoyment. They like to experience the world in a tangible way, and they like to interact directly with it. They are less concerned with discussing and speculating about abstract possibilities or conclusions, which is something intuitives love to do. SJs also tend to like movies and books that have a sequential storyline and are easy to relate to from their own experience. Intuitives love theoretical books and non-linear storylines. They enjoy symbolically-driven and abstract cinema. This isn’t a big issue, but it can cause rifts between couples who can’t come to an agreement on what they want to watch/read/participate in. SJ types can feel that NPs are too spontaneous or impulsive. They may push the NP to settle on a decision before they’re ready. They may also try to push for a more structured outline for their day. This can frustrate the NP who now feels that they are being stifled by the SJs plans, deadlines, and routine. Alternately, the SJ may feel unstable trying to conform to the NPs lifestyle of spontaneity and open-ended plans. They may feel that they have to try to be more “easy-going” and the effort may tire them out or cause them stress. Intuitives have a difficult time taking things at face value. Our minds are designed to find connections and meanings behind things. As a result, the SJ might make a simple statement, and the intuitive will often extrapolate information from that one comment. This can lead to misunderstandings and frustration for the sensor who just wants to be able to speak his/her mind without having to defend themselves or explain scenarios that never crossed their mind. Intuitives and sensors can both start feeling that their partner’s mode of perceiving is inferior to their own. 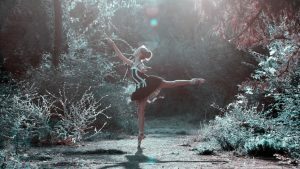 The intuitive can feel that the SJ is too focused on “useless” traditions and “boring” techniques that have no room for innovation. The SJ, in turn, can feel that the intuitive is too wrapped up in intangible, unproven theories and “fancies” that have no basis in reality. Both types can turn up their nose at their partner’s perceptions, their lifestyle, and the information they trust. – Go out of your way to appreciate each other’s strengths. Complement each other on your differences. For the intuitive, this can mean praising the SJ for their dedication, their attention to detail, their responsibility, practicality, their thinking or feeling strengths. Remember, this is all part of what drew you to them initially. – Find interests and activities you both enjoy. Believe me, they are out there. I guarantee you can find movies and books you both like, games and projects you both love. Brainstorm about shared interests and activities and keep them mentally available for times when you want to spend quality time together. For the intuitive, find a sensing hobby you enjoy doing. For the sensor, find a theoretical topic that interests you. This will be easier once you reach mid-life and start developing your tertiary and inferior functions. Spending a little time focusing on your partner’s preferred area of interest will not only show you care, but will help to advance your cognitive function development. – Do not start thinking your preference makes you better or “superior“. Remember that neither of you is innately “better” because of your sensing/intuitive preference. Stop yourself if you start thinking condescending thoughts about your partner. It’s not productive, it’s not fair, and it will only cause conflict and dissatisfaction. – Watch out for each other’s “triggers”. If your dominant function is the inferior function of your partner, you can cause them stress. If you have dominant Ne and your partner has inferior Ne you can overwhelm them if you are continually forcing them to focus on their inferior function. It’s important to have relationships and friendships where you can discuss ideas and topics that center around your dominant intuitive preference, but try to use moderation when pushing your partner to discuss topics that cause them to utilize their inferior function. This means that partner’s need to be especially careful in ENP/ISFJ relationships, and ENP/ISTJ relationships. – Be patient. In mid-life each person starts to develop their tertiary and inferior functions more. Many sensing/intuitive relationships improve in mid-life once both partner’s start developing their opposing preference more fully. SJs will enjoy using Ne more as they reach mid-life and intuitives will enjoy using sensing more as they reach mid-life. – Love each other. I know this is probably pretty obvious. When you love someone you take an interest in their ideas, their life, their plans, their interests. It doesn’t matter if their stories don’t apply to your sensing/intuitive perceptions, you care about them, so you make their life important to you. When you love someone you’ll love their life and their mind and you’ll work to understand it. You’ll listen, be attentive, and show them you care. We all slip up in this area from time to time, it’s all too easy to get distracted or “zone out” when someone is speaking. But really make an effort to stay tuned in to your partner as much as possible. ), these are the satisfaction percentages on various sensing/intuitive pairings. I know those statistics could look a little depressing, but please don’t take them to heart. 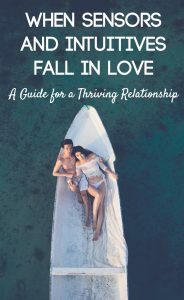 If you’re on this page you’ve obviously taken an interest in your partner and understanding them, and that is a HUGE step in having a thriving relationship. Many couples have never gone that far. Are you in a sensing/intuitive relationship? Do you have any thoughts or suggestions? Let me know in the comments! Did you Like This Post? Then You’ll Love These! Are You a Sensor or an Intuitive? How to Find Out! While I agree that the charts have a lot of facts to back them up, I think what matters most in a relationship is how healthy the personality of both individuals are. After all as you said, opposites complete each other and also give us a chance to empathise with others who are different from us. My parents, ESFJ and INFJ, are united by an arranged marriage when they are both in their thirties, both responsible and matured and many times in my teens when I was old enough to understand the problems that we encounter as a family, I have always been amazed by how well they complement each other and how much they complete one another. My sensing mother keeps the house running in clockwork fashion, always keeping my dad’s comfort as his priority and whenever someone hurts my mom’s feelings, she could find no pillar stronger to support her than my dad. My dad trusts her through any doubts thrown at him and my mom does the same. It is interesting however to note that all of my siblings are intuitives and three out of four of us inherited Fi-Te function pairings from our grandparents. Sometimes our discussion at the dining table takes on a complete intuitive turn and while my mom has a well developed Ne compared to the general ESFJ, she often feels lost and left out and this is a constant reminder to the rest of us that not everyone are like us and teaches us to be mindful of other sensors. Similarly, we Fi/Te users tend to get pointed out our tendencies to neglect social expectations and etiquette and this gives us a greater awareness to how our little actions affect the society and not only it makes us understand others better, it also helps with the way we appear to others and a better chance at gaining opportunities than we would have otherwise. In our dynamic family function combination, we all learn to cooperate with each other, respecting each of our unique values and characters and most of all, learn to trust despite our differences. But we must all learn to give a little of what we hold dear (I sacrifice my excessive ENFP chatter for my dear introverted sisters and my annoyance of wasting meaningless time for my mother who appreciates a good chat over what I consider to be frivolous matters that I have learned to enjoy as bonding moments) for a relationship to be successful and I truly believe that such relationships make us better individuals as a whole although the path to it is not an easy one. Thank you so much for sharing your experience and perspective!! ESFJs are indeed wonderful at running a home. I am always amazed by their dedication and organization. Sounds like your parents are an amazing pair for each other. It’s also wonderful that you all are trying to connect and involve everyone in conversation. I think each of us have so much to learn from other types that function differently. Thank you again for reading and sharing your thoughts! I am an INTJ female married to an ESFJ male for 27 years. My husband has long referred to me as the Vulcan and himself as “the emotional man”. We knew nothing about personality types when we married and have faced many challenges over the years. Learning about our personality types has been a great help. We now have a better understanding of each other’s communication style and need for social interaction or solitude. He has helped me be more practical. If I had married a fellow NP, my house would probably be a wreck because I just wouldn’t notice the mess. He also helps me be more cautious since I tend to trust everyone. Why? Why? Why? You started the article so beautifully with that we shouldn’t use this as a guide and that “those charts do more harm than good.” Then you proceeded to show your list of statistics and follow it with a list of “are you compatible?” So you know, I am in the lowest of your statistics, have five kids, a beautiful wife of eleven years, and have struggled and struggled with every single challenge you listed and more. While I want to be a great person and would not say a single negative thing about my spouse, the pain of this difference has cost us horrendously. I would not wish it on my children and have endured counselors and friends who gave their advice based on their marriage with a person of greater compatibility. Even the counselor and his wife with identicle personalities shared numerous painful stories and semi hope. My wife has read this and agrees. I would teach my children you can make any marriage work with dedication and hard work, but why put yourself in that situation? “Balancing each other” can mean filling in gaps, but more often it means pooring hot and cold water together to become a bland lukewarm mixture. If you haven’t become lost in the “in love,” wake up and take it seriously. You are not invincible and you will almost certainly face these struggles on top of the normal marriage difficulties. Brad, you totally get it, and I wonder if you are similar to my type LOL! I am an ENFP (f) with an ISFJ (m) and I definitely feel like for the ‘work’ of it all, with never the desired result. It’s like death by a thousand cuts, a slow heavy bleed that you keep trying to put a bandaid over. Feels like expectations need to be lowered and never ask for ‘too much’. What kind of a life is that!?1?! I have already banned having children, I couldn’t imagine being saddled with taking care of my ISFJ’s feelings and preferences, all housework etc, having a full time career AND rearing children! Thank you for your input, it makes me feel less ‘shame’ about what I already know and see in the relationship. Brad, I can only agree with you. However I’m in a very different place, in a truly new relationship. And I’m about to jump out. ENTP and ISTP in our case just doesn’t work. We constantly misunderstand each other, it’s amazing. Now it’s hard to understand how the beginning was so magical and The connection so perfect. I guess the opposites do attract. Realizing he is also P made me think we would fit well. After understanding his type I was thinking maybe we can complement each other. But now I’m coming to the conclusion this is too much work. We talked about this, decided to continue but in the coming days we need to have the ending discussion. I want to be with somebody who is happy of me being me. I don’t want to make myself smaller. I want the connection flow and mostly be easy. I know in all relationships there are issues but why make it harder than it should be by being in a relationship with the personality type that has as a starting point a alot of challenges. All the best for you and your wife Brad! Well, I am still searching for the words and cannot really express my thoughts. I am really in your shoes (I mean wearing the shoes you wore in September) and struggling every single day and hesitating what to do. Brad’s words hit me really hard, because that’s just the same thing I am telling again and again to my boyfriend: “You are not invincible and you will almost certainly face these struggles on top of the normal marriage difficulties.” I also do agree with his opinion of what “Balancing each other” really means. I am an INTP, he is an ESTJ. I am an Aries with Taurus ascendant, he is a Virgo. Our struggles are exactly the same the author mentioned above (we have been together for 1.5 year), yet he wants to marry me and thinks we would be able to solve anything, while I am trying to convince myself that it would be easier for both of us if we found someone else who is more like a soulmate. I just have started a therapy and that’s also the cause of my inner struggle because I am not happy or contented with anything in my life and I try to leave anxiety and depression behind me, so I must say I cannot really see clearly, while he is really patient, helpful and understanding about everything I am going through. Still, it is just really hard. I could not agree more with Brad on the content of the blog post: the promising start and warning me not to deal with charts and emphasising that every person and relationships are different > then pointing out the struggles we have daily > then showing a dissatisfying number… Ahhh, maybe I should just read less articles and think less about these things (or everything – INTP). I, a male, am also an INFP and am interested in knowing a girl with, possibly, an ESFJ type. Yep, I hardly know her, but hopefully I will be able to start the relationship and get to know the “real” her. Recently, I learned about the cognitive functions, which definitely helped me understand better how each type functions, no pun intended, and how each type is unique in spite of having one letter difference from other types. The cognitive functions also helped me realize that I do have the potential of thinking rationally and acting on it. Thank you, Susan Storm, for working on this blog, it has helped me become more grounded in my personality type theories. The INFP Male article was amazingly accurate on how relatively well my parents raised me. (ISTJ dad and INFP mom). There are so many helpful articles on how to improve my relationships with my family, (mostly SJ types), and people that I interact with nowadays. As far as this article, it is great to know what the harmony and struggles can look like in a sensing/intuitive relationship. Fortunately, I have a great example in my parents, and I can always go to them for help. I have never had an official boyfriend/girlfriend relationship. Sure, I have had crushes on girls since elementary school, but never had the courage to approach them and just be unapologetically me, while getting to know them at the same time. I also think, to have a stable relationship, one has to have something constant to fall back on that one knows will never fail. For me, this is my relationship with God. Yes, I am a Christian, but bear with me. As an INFP, I naturally do not like conflict, whether with my internal feelings, or my desires with others’ expectations. So, when I do encounter conflict, and if it blows up dramatically, I can always turn to God. He is the constant I can fall back on when I am in great stress. I know, you may not understand this, but for me, this is true. If you do not have a relationship with God, this peace can still happen to you, too. The greatest source of truth I can give you is the Word of God, the Bible, God’s very words to you. If you have any questions, ask around at any local churches. If they truly want to help you understand His Word, they will go over and beyond to help you. I know that last paragraph was spontaneous, but I don’t care. Maybe you needed to read this. So, going back to the potential relationship I could have with an ESFJ girl. I can see how we can complement each other, but I appreciate the cautions you provided, Susan Storm. Thanks again for this blog, I will definitely refer back to it from time to time. Wish me well! To anyone reading this, I genuinely hope you have a wonderful day! This article reveals a really great, in-depth understanding of how sensors and intuitives function together in relationships, but I have to agree with Brad, Tiina, and Adrienn: Sure, you can force such a relationship to work, but why not just be with someone whose personality meshes with yours more naturally? All relationships require effort, but why add even more effort to what’s already necessary? As an INTP woman, I would love to find a sensor man I’m compatible with. Truly. Since sensors outnumber intuitives by about three to one, it would make dating a lot easier for me. But what I keep running into with sensors is exactly what this article describes–they don’t enjoy the conversation I enjoy, they don’t like the activities I like, they don’t trust my intuitive insights or predictions. In short, they don’t value what makes me ME. So why would I want to be with one of them? I’m of the opinion that a relationship partner should be your best friend. 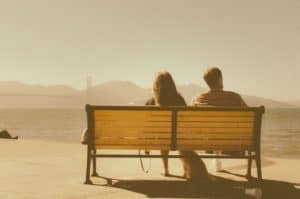 But if, as the article so accurately says, an intuitive ends up “unfulfilled if their partner doesn’t engage or seem interested in the possibilities they are bringing to the table” and ultimately has to “constrain their numerous thoughts because their partner simply isn’t interested,” how can the intuitive call the sensor their best friend? Who wants to feel that their best friend doesn’t understand or take an interest in what they say? I hear about successful sensor/intuitive relationships, like the one described in this article, and I wonder how they can truly be fulfilling, especially for the intuitive. I’m not saying that to be dismissive or belittling of those relationships; I’m genuinely curious because it boggles my mind that someone could be happy in a long-term relationship in which their partner doesn’t appreciate their ideas or can’t even follow them. Whenever I’m talking to a sensor and realize they’re not interested or don’t get what I’m saying, it’s very painful because I also realize how much distance there is between us, and I lose my sense of connection with them. And unless your concept of a LTR is just pairing up to run a household and raise kids, isn’t it all about connection? I don’t know… I guess some people just have very different relationship priorities than I do, but I want a soulmate, and I can’t feel that kind of connection when it’s just constant disconnect. I’m totally with you intpondering,I’m a intp female and I have always struggled finding someone that cares for what I have to say or respects my way of thinking.i didn’t know about Mbti when I started dating but now it’s clear to me that most ppl that brush off what I say or thinks I’m crazy were indeed sensors. So it’s good to keep it in mind and not push urself to be with someone u don’t have a deep connection with, I divorced a while ago, my ex was a esfp and outsiders thought we’re a great match but I suffered a lot and was not satisfied.